Protesters demonstrating over the eviction of people from a building that was subject of a repossession order blocked the junction between Dublin's Parnell Street and O'Connell Street. The Take Back The City group said it held the protest in support of five people arrested during the repossession of the property at Dublin's North Frederick Street yesterday. It claims that four other people were injured during an operation by a private security firm and gardaí to end the occupation. 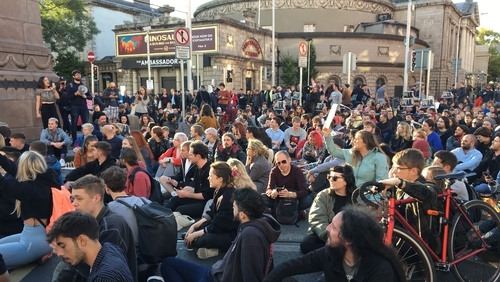 Up to 1,000 protesters gathered on North Frederick Street before marching to the junction of Parnell Street and O'Connell Street, where they blocked traffic. The group, which it says represents 18 "grassroots organisations", previously complied with a court order to vacate a building on Summerhill Parade and occupied a third property on Belvedere Place - all in the north inner city. It comes after the Private Security Authority said that people involved in the execution of repossession orders are not licensable by the body. The PSA was responding to a claim by the Labour Party that the private security hired to remove protesters from the property on North Frederick Street last night appeared to break the law by not wearing any identification. In a statement the PSA said the execution of repossession orders does not fall within its remit and that the law and procedures in this area are contained in the Enforcement of Court Orders Acts and rules of court. The PSA also says that any dispute in relation to the execution of a court order is a matter for the courts. A number of politicians, including Solidarity TD Mick Barry and Social Democrats Councillor Gary Gannon, also expressed concern about the role of gardaí in the eviction of protesters from the house in North Frederick Street last night. The owner of the property secured a High Court injunction two weeks ago ordering the protesters to leave the building the following day, but they did not. The men who evicted the protesters had their faces covered and community gardaí, as well as officers from the public order unit, were on the scene and also had their faces covered. The Garda Press Office said members of the public order unit were wearing fire retardant face masks, which are part of their uniform. The protesters left the house peacefully but five other people, four men and a woman, were arrested for public order offences. Gardaí say two were subsequently charged with public order offences, two were given adult cautions and in the case of the other person a file will be sent to the Director of Public Prosecutions. All five were then released. In a statement this afternoon, Garda Headquarters said it does not comment on remarks by third parties, but An Garda Síochána respects the right of people to protest peacefully. It says the force's role at such events is to facilitate peaceful protest while protecting the rights of individuals to do their lawful work safely - in this case carrying out an order of the High Court. It also says An Garda Síochána's objective with any such operation is to ensure the safety of the public. A spokesman for the Garda Representative Association said "the ski mask is sometimes worn by the Public Order Unit for their own safety." GRA Director of Communications John O'Keeffe said "the hood is flame retardant and in a time when horrific acid attacks are becoming more prevalent, it also offers some further protection from sprays or gases, or any other noxious substance." He added that "the idea that our members were somehow part of the problem, is errant nonsense." Amnesty International Ireland has raised concerns about "possible excessive and unnecessary use of force" during the eviction. "Gardaí should only facilitate and support the actions of private security personnel where they are lawful and do not involve excessive force," the group said in a statement. They said it is of concern that the private security personnel reportedly failed to display identity badges, as required by law. A number of political parties, including Sinn Féin, the Social Democrats, the Workers' Party and Solidarity-People Before Profit, have also raised concerns over the actions of gardaí during the protest.